Financial advisor Dan Benson exposes the twelve biggest mistakes people make with their money and clearly demonstrates how readers can move from financial insecurity to financial freedom. Proven, practical help for negotiating the financial minefields of life. 5. Failure to handle the "set aside"
7. Not caring for the "temple"
Description: Financial advisor Dan Benson exposes the twelve biggest mistakes people make with their money and clearly demonstrates how readers can move from financial insecurity to financial freedom. 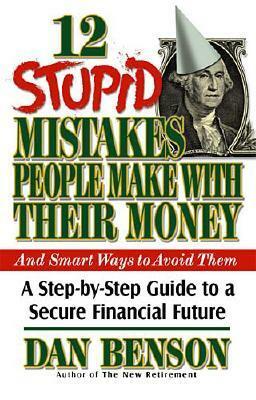 Proven, practical help for negotiating the financial minefields of life. 1. Misuse of credit 2. Letting greed take control 3. Thinking of today and not tomorrow 4. Motor toys - the biggest cash drain 5. Failure to handle the "set aside" 6. Not knowing what to do with the $ 7. Not caring for the "temple" 8. Either too much or too little insurance 9. Following fads vs. staying the course 10. Lackadaisical giving 11. Letting Junior eat away your nest egg 12. Not taking advantage of tax breaksGreen cloth with gold spine lettering. xiii, 174pp. Full refund if not satisfied.